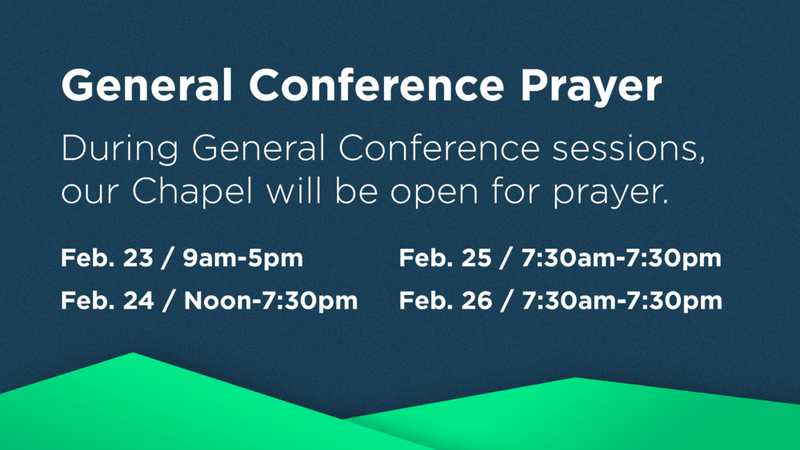 The 2019 Special Called General Conference will begin with a Day of Prayer on Saturday, February 23. On this day only, we will livestream the conference in our chapel so that we might experience this time of prayer together with our brothers and sisters in St. Louis. During all four days of General Conference, our Chapel will be open so we can gather to pray. Saturday, February 23 / 9 a.m. – 5 p.m.
Sunday, February 24 / 12 noon – 7:30 p.m.
Monday, February 25 / 7:30 a.m. – 7:30 p.m.
Tuesday, February 26 / 7:30 a.m. – 7:30 p.m.
As United Methodists, we are joining our brothers and sisters throughout the community, this district, our annual conference and annual conferences throughout the world in prayer.